Company Name: MEIHO Co., Ltd. The year of 2012 marked the 35th anniversary of our business establishment. In the past 35 years, we have focused particularly on die-manufacturing as our core competence, while we have continuously advanced our technology and expanded our business into molding field. To our great delight, our molding machines and molding dies have been receiving good reputations from our customers and users. “Mold and Die” is a big word. They vary in size and quality according to demand and use. Among their wide variety, we, as an expert, have focused on producing “smaller” and “more precise” articles so far in our business of dies, molds and mold machines. Japan is the tops in making such articles. Commemorating our 35th anniversary in 2012, we are pleased that we have at last achieved our own integrated production system in precise molding, which ranges from manufacturing facilities (mold dies, molding machines and automated molding machines) to mass-production system (injection molding and assembly). With this achievement, we would like to offer our customers both manufacturing intelligence and systems in the process from prototype to mass production and so we would like to further strengthen our relationship with them. 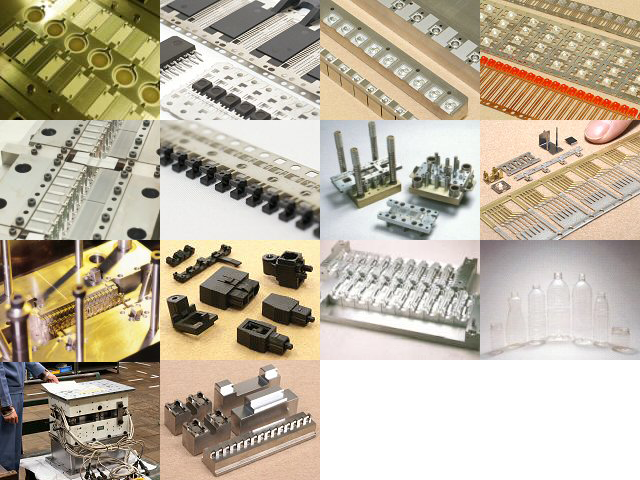 Semiconductor maker, Electronic parts maker, Automotive parts manufacturer, Molding machine manufacturer, Connector manufacturer, Robot manufacturers and etc. MEIHO’s Integrated Production System(Press Die, Molding Die, Molding Machine & Automated Machine) offers you a stable supply of fine & complex precision insert molded products. MEIHO is also an OEM company which has developed our original production equipments such as Press Dies, Molding Dies, Molding Machines and Automated Machines. 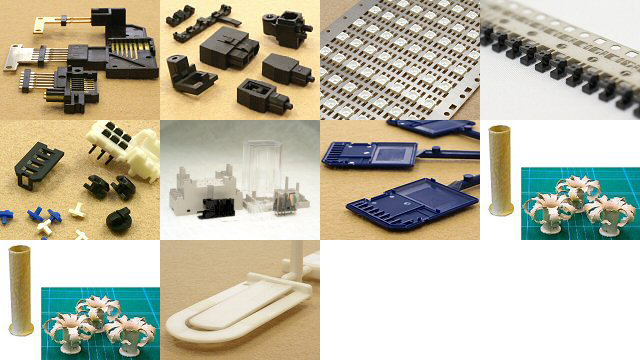 We supply customers with precision insert molding products of high quality and precise molding products, such as connectors, sensors, switches, relays and plastic lens. They are all produced under our severe quality control in the clean working environment, which is fully air-conditioned and dust proof. super engineering plastic (LCP, PES, PEEK, Polyphthalamide), thin-wall molding, etc. Our molding techniques and severe quality control bring you high quality products at lower costs, just in time you need them. MEIHO helps you to commercialize your creative ideas. We proudly design and manufacture new molding systems that combine molding machines and automated machines, and develop customized molding machines for you. Thus, we actively respond to your varying demands for innovative production. We have developed precise insert molding systems to become more competitive worldwide. We offer you optimum molding systems to satisfy your manufacturing types including that One-Piece Flow Manufacturing Precise Insert molding without parts feeder, Line-Side Molding by compact facilities, Systematic modification for model changes and etc. 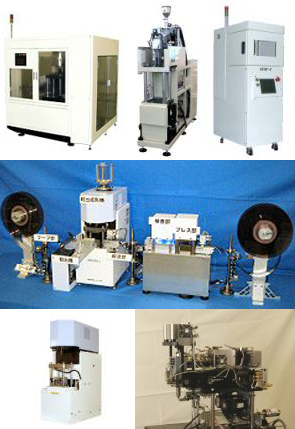 Japan-made ultra precision molding dies are well-known for its high quality all over the world. 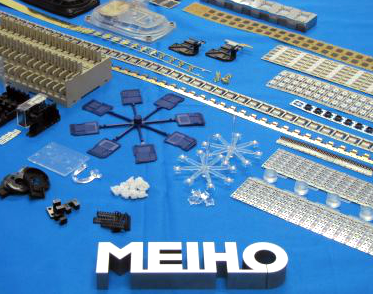 MEIHO brings you high-quality products developed by high-level designing skills and advanced processing techniques we have accumulated through our over 30-years’ experiences. Die manufacturing is one of the most critical factors that controlthe quality of high-functional parts and components. To offer you the most suitable die designs, materials, etc., among manychoices, we participate in parts makers’prototype development process, conduct the flow analysis and so on. Thus, we work on the optimal die designing which surely satisfies your demand. Overhauling, modification and parts fabrications are also provided to meet your requests. And robots parts and machinery parts-fabrications are available too.